Play the True Sheriff Slots Machine Online! Stories and legends of Wild West were used for several movies, TV shows, computer games and etc. Developers from Betsoft Gaming took this theme and created software for a beautiful and exciting 3D video slot the True Sheriff. Shootout in bars, cardsharpers on the streets, fights between cowboys and other illegal things need to be solved by the brave sheriff. If you want to feel this thrilling atmosphere of the danger and smell of dust of Wild West roads, then play this amazing video slot. • Bonuses: Bonus (a revolver symbol), Scatter symbol (sheriff`s star) and Wild symbol (Wild title), free spins. The main symbols in the slot are: the sheriff, the girl, the bandit and the owner of the saloon. 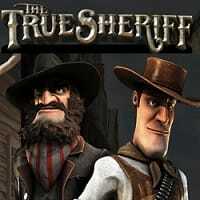 Play a free demo of the True Sheriff online slot machine and increase your gambler`s level. Study all the options of the slot to be well prepared for a game on money. You can play a trial version without registration and deposit, just to have fun.